This year marks the 90th Anniversary of the Republic of Austria. 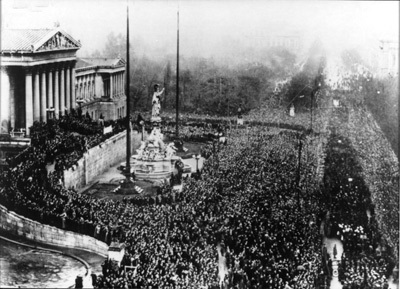 On November 12, 1918, in front of the Houses of Parliament, Austria’s first State Chancellor Karl Renner proclaimed the birth of the Republic. This followed a long and laborious process of political peace efforts. After the armistice agreement between Austria-Hungary and the Allied Forces was signed on November 3, one week later, on November 11, 1918, Germany and the Entente Powers signed an armistice agreement. This marked the official end of WWI. On the same day, Habsburg Emperor Karl I relinquished his throne and renounced all participation in the affairs of state. After the First World War, the Austro-Hungarian Empire disintegrated, torn apart by its various ethnic groups, including Hungarians, Czechs, Poles and Croats, who were all seeking independence. What remained was a new Austrian state one eighth the size of the Empire with 83,900 square kilometers of territory and a population of six million. From the beginning the young Republic suffered from many political and economic difficulties. For the small remaining entity that was once a great European power, it was difficult to find a sense of identity. Unlike other European national states, the Republic of Austria was born more out of self-doubt than of euphoria. What followed were years of economic crisis, political disputes and even armed hostilities and finally the darkest chapter of Austria’s history, the years of National Socialism. Official anniversary celebrations on November 12, 2008 began with wreath-laying ceremonies at the monument of the Republic and at the memorial to State Chancellor Renner. During a festive ceremony at Vienna’s Hofburg, the leadership of the state and of the government participated in commemorating the historic anniversary. In his address President Heinz Fischer described the birth of the Republic as “difficult” and wished the Republic a “peaceful future.” At a Special Council of Ministers of the federal government, Federal Chancellor Alfred Gusenbauer praised the achievements of the European Union and of European integration. Celebrations included the opening of the “Exhibition on the Republic” and the “Concert for Austria” at the Musikverein in the evening. The exhibition entitled, “Republic 1918/2008,“ marked the 90th Anniversary of the foundation of the Republic of Austria and will be on display in the Austrian Parliament from November 12, 2008 to April 11, 2009. The exhibit covers the founding years up to 1920, the key events of the 1930s, the National Socialist dictatorship, the occupation period, the Second Republic after 1945 and European integration. The exhibition was conceived by historians Stefan Karner and Lorenz Mikoletzky, who developed an extensive program, which involved many researchers. Their contributions were published in a volume celebrating the 90th Anniversary of the Republic. Special guided tours were also offered to students and a “Democracy Workshop,” sponsored by Parliament, was offered focusing on modern history.